After the Celtic invasion of Greece and Macedonia, several thousand Celts crossed into Asia minor where they would ultimately inhabit the region of Galatia in what is now central Turkey. 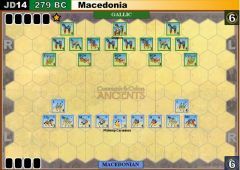 The Celts were causing trouble for the Ionian Greeks in the form of raids and extortion and so the Greeks called on the Seleucid Emporer for help. 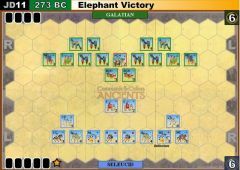 Antiochus despatched a fairly light force agianst the Celts supported by 16 Elephants. The Celts had not encountered elephants before and their appearance was a great shock to them so that they were subsequently easily routed. The Asiatic Greeks named Antiochus "Soter" The Saviour in honour of his victory and Antiochus had a trophy made with the figure of an elephant to honour their part in his victory. 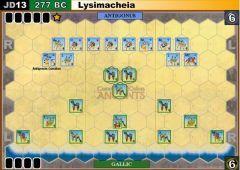 Use Carthaginian blocks for the heavy chariot unit. Elephants will battle with an extra dice and Galatians will battle elephants in close combat with one less dice. 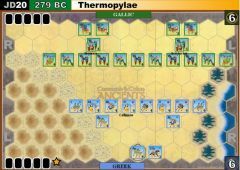 The Seleucid player starts their 1st turn with a mounted charge order that only applies to the elephants. No card is played or drawn on that turn.